Caroline..Artist Afloat: Trip to Littlehampton. Went down to Littlehampton to see my Goddaughter Mabrina over the Easter weekend. Amazingly enough no internet there, so was unable to get on line at all !! Anyway it was a nice weekend, lovely to see Mabrina and all the family. 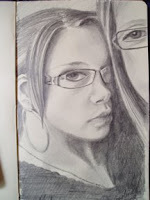 The sketch in my moleskine was done from a photo that Mabrina had taken of herself and her mother on her birthday.